who share a common mission. At Portland Women Writers, our passion is to offer a safe environment where women access their creative power and express their authentic voice. Our writing workshops give you the opportunity to share stories in a fun, transformational, and vibrant community. We offer breathing space for creative expression for beginning and seasoned writers and for women who identify as female of all ages and backgrounds. Writing our stories, whether they orginate from our lives or our imagination is a sacred act that heals and transforms us. When we write we remember who we are. We reconnect with parts of ourself that have gone into hiding and thereby practice the art of reclaiming our wholeness. We connect with the voice beneath the voice. Writing in community is soul work. It takes us down to the blessed dark where our stories of loss and grief, transformation and becoming await. We gather the ash and the truth of the coal from these stories and through our writing build a new fire to live by. Writing in community renews us. Through our writing we envision. We imagine. We pull ourselves back to the light on the wings of our natural creative genius. We transcend. We soar. When we commit ourselves to a regular writing practice we learn to listen to the great intelligence of the heart and our writer's voice becomes strong and sure. In the company of other women we are inspired, encouraged and forever changed. 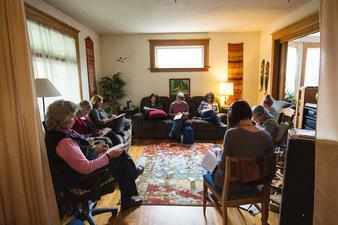 "Portland Women Writers creates the best kind of community. A safe and sacred circle where women can speak the truth, create, and come to know their hidden talents. There is some kind of magic that happens in these circles. They are life changing." "These workshops are church, therapy and a party all at once...I am so full of gratitude for Dawn and all you ladies of Portland Women Writers—for the transformative experience of holding sacred space in writing circles to cultivate voices and tell stories." "...There is something about being in the circle and watching you hold space that, in borrowing a tiny pinch of this alchemy, it allowed me to be so present and in the moment with my grandmother. We went through photo albums I have never seen before and she told me all sorts of stories about her childhood and her war years that I had never heard. I have written about her quite a bit in our groups, and unearthing those memories and tying the past to the present meant so much to us both...I hope you know how valuable this work is and how lingering the impact." "I have taken weekly workshops through Portland Women Writers for the last few years now. It is the touchstone of my week. I have been writing for a long time and have been in many different styles of writing groups and writing programs, and this is the most supportive one I have experienced. I have come home to my own voice while being in these groups because they are both nurturing and alive--great places to grow writing. And they are so skillfully facilitated. I can’t recommend them enough." "...as stories are shared, bread broken, honesty spoken...moment by moment we are revealed, become known. To me that is the essence of writing, or maybe even just being. The yearning to be known. To share what matters, to be heard. It is an act of love on a scale that transcends the body and moves into the soul. To be known and to know. To feel a part of something beyond ourselves. To be understood. Why is it so rare? I do not know. What I do know is that when someone shares with authenticity, there is a connection that warms my soul, makes me feel less alone. A treasure I hold, then must let go. For the connection is but a moment. But that brief moment is what holds us, moves us forward in some way to the next moment. A gift of the soul."